Good for you Deb! 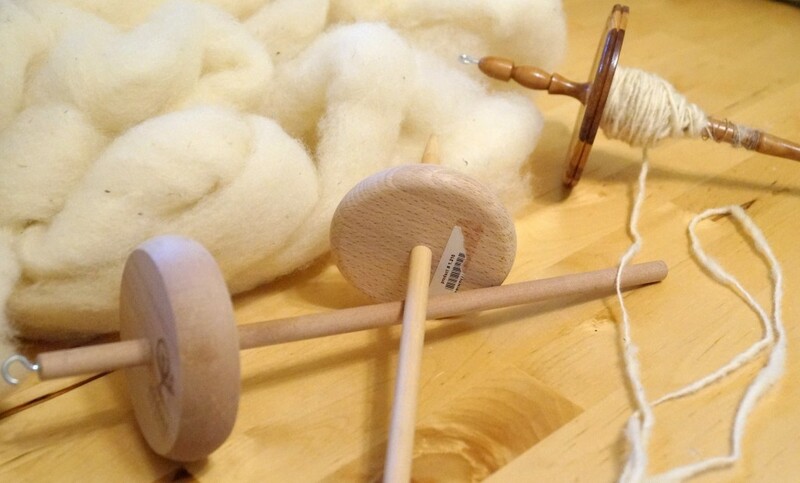 I also thought it looked so easy when I saw documentaries of women doing their own spinning, walking along, not paying attention to what they were doing and beautiful, perfect yarn being produced. Easy! HAH! Jack’s mother used to card and spin her own wool, when her first children were born and kept it up until after Jack, her last, was grown up. But she had a spinning wheel. Not the big wheel kind or any spoked-wheel kind but a western-Canadian made “Spin Wheel” from Sifton Manitoba. I looked it up on the internet and although different looking, it made miles and miles of yarn that she turned into hats, scarves, socks, mittens and other items. A few months ago, Jack’s cousin died and he had the family spinning wheel but Jack’s brother, knowing I like antiques, brought it back to the family home and it now sits proudly by my fireplace, waiting for someone to send it spinning again…..but it won’t be me. So, the next time you come for a visit, we will have to get us some sheep wool and you will have a job while we visit with whoever you brought with you. Sounds like a plan, don’t you think? I just want to say I think it is wonderful that you want to learn to spin! I am impressed by what you do. I’m sorry to say that the sheep across the road have been sold but I may be able to get some raw fleece for you from some people I know that have sheep. I also met a woman that has sheep that have hair-type fleece that doesn’t need shearing but don’t know if it’s any good for spinning. I could ask her. I’ll get back to you about the wool fleece and about the hair-type fleece. He also told me that the people a few miles away, that used to own and run the Belle Vallee Wool Mill, that burned down, still keep their hand at spinning etc and if asked, the woman would probably help anyone in the art of spinning, carding etc. He also told me the local Country Store, run by Mennonites, has supplies people need to card their own wool. I never looked for those things while there but the next time I go, I will check them out. The bags of raw wool he has haven’t been cleaned but he will try and give, (he did say give), you wool that will be as clean as he can get it. So, now that we have things lined up, all we need is a visit from the person that will be doing the work. Oh my goodness Lydia! That is fantastic! Tell him thank you very much! I will plan a trip up in the next month or so now that the weather is finally nicer. YAY!